I know this is an old post but it’s my first time here so I HAD to check out the empty nest tab. A box for each child to put on a shelf. I like this idea. Usually it’s men who can be more compartmentalized toward life. I like the ability. Great post. I’m glad I found you and will definitely bookmark your site. Barb, it doesn’t matter how old this post is, it’s still relevant. So I’m very glad you came across it. Compartmentalizing is a great coping skill. It allows me to get in with my life without dwelling on that which I cannot change: the fact that the kids are grown and have lives of their own. So, thank you for reading, and Happy Compartmentalizing! 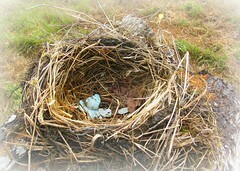 Empty nest. Yup, did that last year. Bereft for a week or two, but then I realized how much work I could get done, and how much freedom I had. And also that kids come back and forth, so you do get to see them again, after all! Every time my elder comes home from college (from far, far away) – he stays just long enough for me to get used to his (delightful) presence, not to mention the dozen friends that are usually in tow. Then he disappears back to his “other life” and it’s withdrawal time. I still have one in the nest (here there and everywhere), but I can tell additional partitioning mastery will be required. And before I know it. It’s refreshing to see someone accepting their kid’s lives and not getting all mushy over it. This is YOUR time now. You must be proud that they can leave home and be on their own. You’ve raised them well! Great idea! I would love a Sophie box! This is a great post! Although it started to make me cry when you talked about how quickly 18 years went. I’m already dreading the day Sophie leaves me. Speaking of, you can always start a Sophie box too. Wow…I’m impressed! My boxes all seem to be overflowing right now, so much so that I may need an autumn-style spring cleaning in the near future.